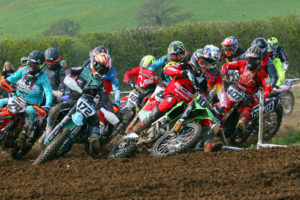 The annual Portsmouth Motorcycle Racing Club’s Mudfest event attracted a a big name racer in the face of Dakar Rally athlete Sam Sunderland to their Woodberry Lane course on Sunday. Fresh from finishing a fantastic third at this years Dakar, Sunderland put on a marvelous display in the boggy conditions finishing a lap ahead of any his rivals, which to be fair is what you would expect from a professional rider with the factory KTM team. Brad Armstrong was the next rider to come over the line winning the Championship class with an exceptional performance, heading home Robert Carey and Lawrence Catt. Barring Sunderland, Oliver Macrae was the top Expert Classified rider and in fact the only other rider in this class to finish. Daniel Guy topped the Clubman A class getting right in among the front runners with seventh overall. Joe Pratt would be the runner up in this group, followed home in third by Tony Cook. Stevie Renenham took the top spot in the Clubman B’s, followed home by Grant Sevo in second and Lee Lawton third. In the Sportsman group Rob Melita belied his class by finishing an excellent 13th overall, and with it the class win from Lewis Smith in second and Peter Woods third. The Veteran’s have tons of experience in the Muddy conditions, but some reveled in it more than others. Over 50’s Vets A rider Tim Newman certainly coped well finishing 10th overall and topping the charts in his class. Adrian Wilkins kept battling through the mire in second, ahead of third placed Peter Farrell. In the B section of the Over 50’s Andrew Brown was the victor, heading home Damian Whyte and Peter Moller. Adam Burt pitched in with 11th overall for the Over 40’s Vet A’s and his class win, while Nicholas Carr landed on the second step of the podium. In the Over 40’s B’s Al Morris won, a lap ahead of second placed Justin Fletcher, with Richard Pomphrett in third.